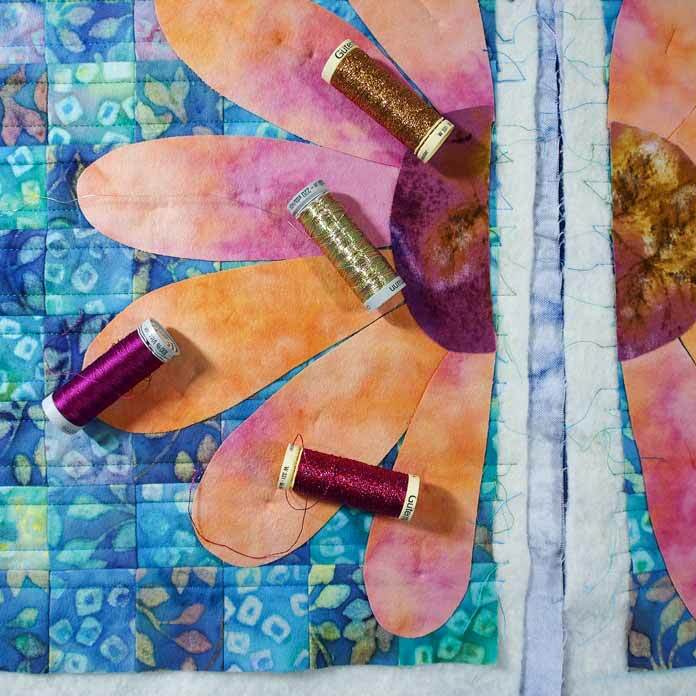 Thread, thread and more thread – so many different ones to choose from. There’s cotton, polyester, rayon and metallic to name a few. My very first attempt to quilt with metallic thread didn’t go as planned. It was my very first quilt project ever and I wanted it to look hand sewn but sewn by machine. I put invisible thread in the bobbin and metallic thread on top. I’ll let you speculate on how it went. Since that day I have tended to steer clear of metallic thread but now I have 4 tips for success with metallic thread to share with you. Dekor Metallic Thread, by Gütermann, is the thread I’ll use to stitch veins in the petals after I have stitched around the edge of the petals. I had planned on using a shiny thread for around the edge of the petals but then decided to use cotton thread. I had a few peachy/pink spools of Gütermann cotton thread and chose the one I thought would highlight the petals best. I used a matching color in the bobbin. The cotton thread line has a multitude of colors and you would be hard pressed not to find the color you need. Same as the polyester line. Both of these thread lines are a 50 weight thread making it easy to work with and not a lot of fiddling with the thread tension when using with more than one thickness of fabric or for applique. 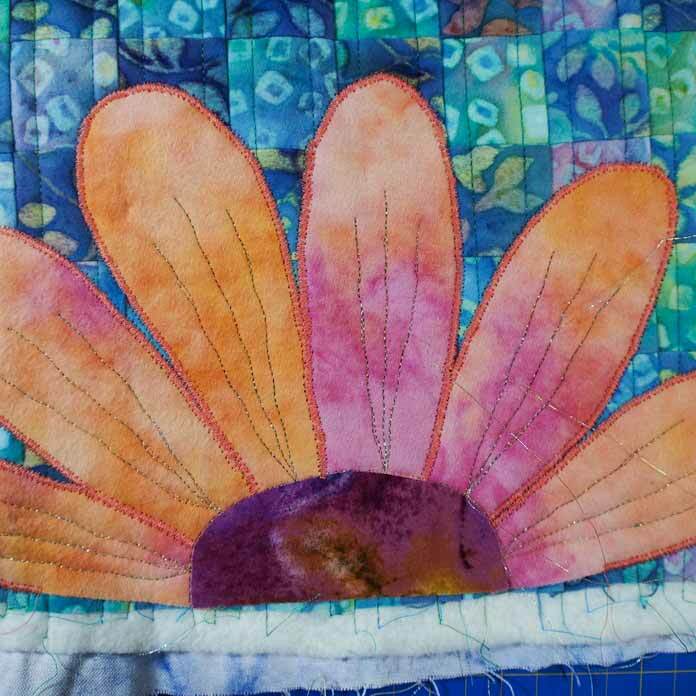 The petals have been stitched with a free motion zigzag/satin stitch – my favorite stitch for applique on most quilts now but especially art quilts. It’s easy to do and faster than regular satin stitch. It still uses as much thread as regular satin stitch. 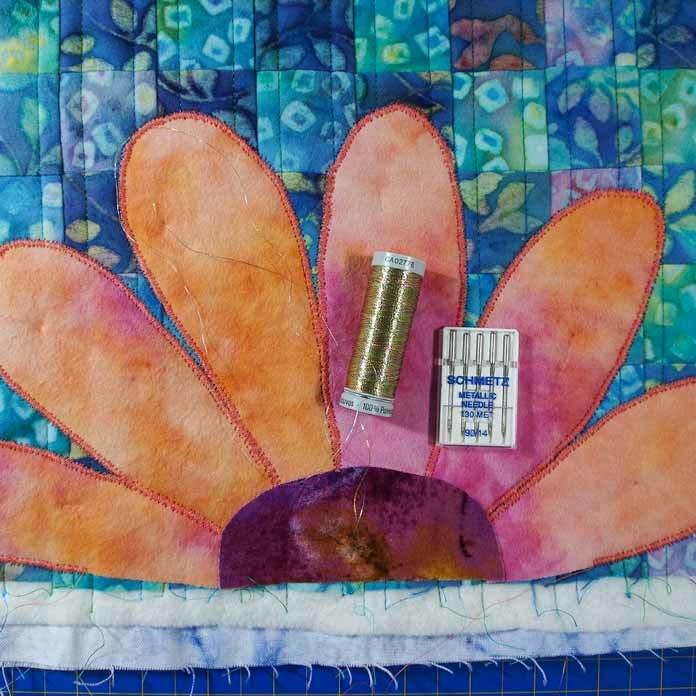 Next up is stitching the petal veins using the metallic thread. 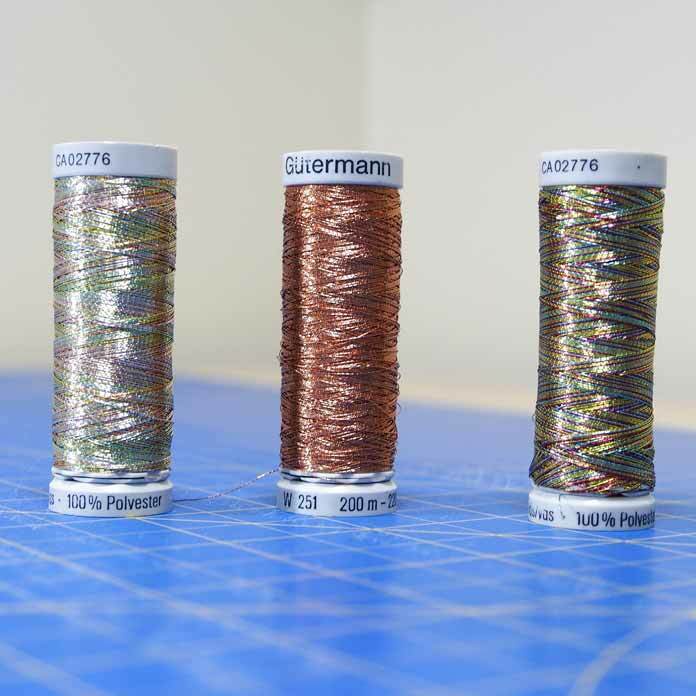 These 4 tips will definitely help with using metallic thread successfully. TIP 1 Use a metallic needle – size 90/14 – these metallic needles are made specifically to work with metallic threads and make sewing easy. TIP 2 Loosen the top tension especially if stitching through more than one layer like I am. I had the tension down to one. TIP 3 Go slow – less chance of breakage and the stitches will be even and smooth. TIP 4 Put thread in a stand on the floor. I find that metallic thread is very twisted when it comes off the spool and sewing machines don’t like twisted thread going through them – that’s when the thread tends to break. I placed the spool in a spool holder on the floor and then thread the thread through the handles on the drawers of my sewing table up to the sewing machine. This kept the thread straight and I had no issues with it breaking and sewing went smooth and easy. Although before I figured this all out, I did end up with a small pile of discarded thread. 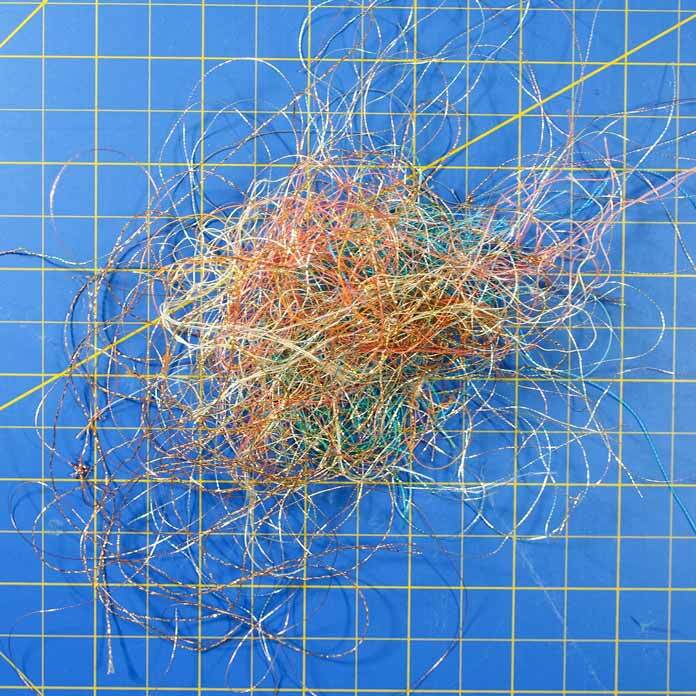 Make sure to visit my October blog posts next month, I’ll show you what can be done with this ‘pile of thread’. I had total success with a crosshatch design using the Sparkle thread. This thread is a thicker thread but I had no problem with it in my machine and it stitched fairly evenly. All I did was go slow and loosen off the top tension. Finally the last stitching is around the edge of the center fabric with a shiny rayon thread. 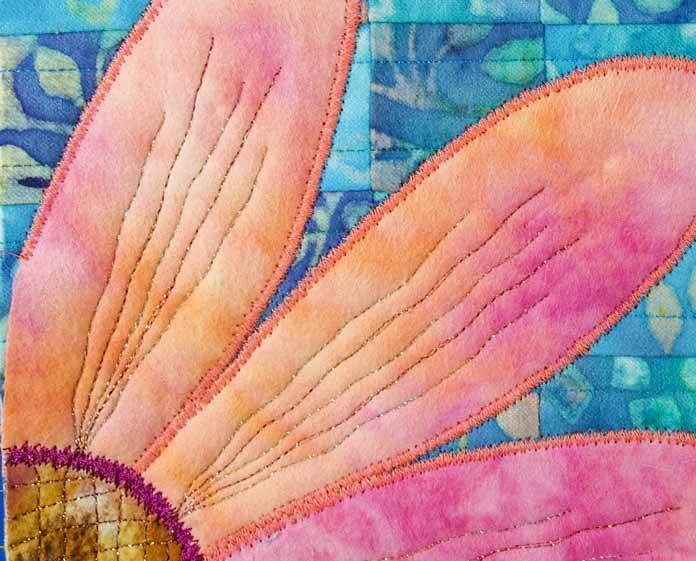 The pink contrasts nicely with the center fabric creating a nice definition between the center and the petals. The rayon thread sewed beautifully. I love how it shines. I’m sure you have noticed that my fabric choices changed from the first day. 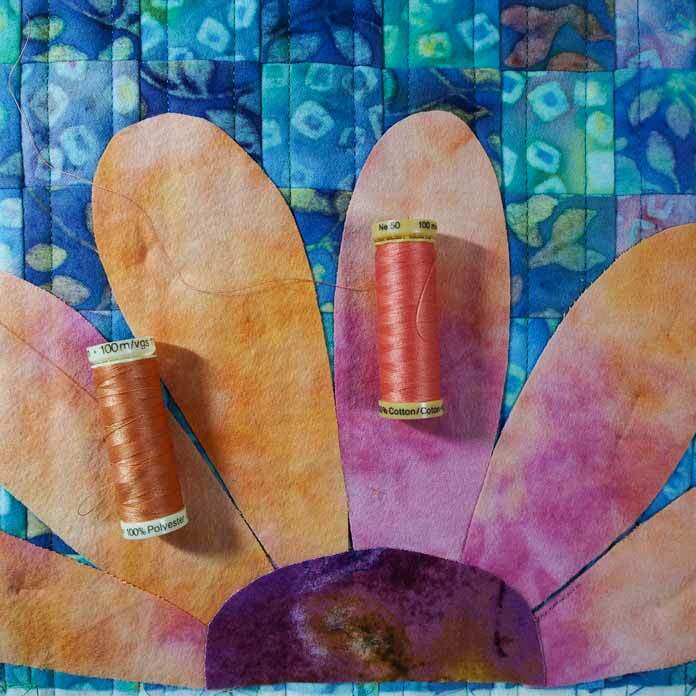 I ended up using the petal fabric for the center and picking a totally different fabric for the petals. The orange/pink petals pop on the turquoise background. In the bobbin I paired a 50 weight Gütermann cotton or polyester to match the color of the top thread for all the different threads above. The laptop sleeve is almost complete. Just need to sew the pieces together and then decide how to fasten the top opening. 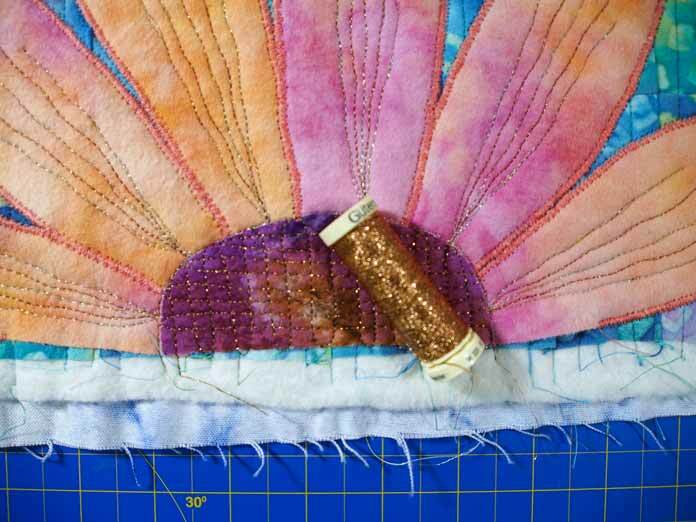 Tomorrow I’ll explore several ways to fasten an opening close but until then I’ll leave you to play with some metallic thread and put into practice those 4 tips for success with metallic thread. Very Pretty! I haven’t tried it but have a couple spools to use up!